Shreyas Bharadwaj is a young conservative. In the past few months, we have witnessed a well organized movement demanding a separate religion (and, hence, minority status). The theological base of the demand lays in 20th century scholarship of the Vachana movement, a movement which is given liturgical (considered holy) respect among significant sections of the Veerashaiva-Lingayat sect. This scholarship on the Vachana movement emphasised that the movement as a 12th century revolution led by Basavanna against inequality and Sanatana Dharma (Hinduism). This view has been internalized by major sections of the community, especially among the educated classes in North Karnataka which has created conditions conducive for the spread of the demand for the status of a separate religion for the Lingayats. The political and religious leaders of these sections, that is, those who view Basavanna as the founder of the sect/religion and reject the Vedas and the Agamas, now call themselves ‘Lingayats’ and take pains to show that they are different from the rest, whom they call ‘Veerashaivas’ as the latter accept the authority of the Vedas and do not give importance to Basavanna in their Guru-parampara. There have been many previous attempts made by the community to obtain the separate religion status as one entity i.e ‘Veerashaiva-Lingayat’. The most recent of these attempts happened in 2011-13 under the leadership of Shamanur Shivashankarappa (currently President of the All India Veerashaiva Mahasabha) and Bheemanna Khandre. The attempt failed because the Veerashaiva section of the sect accepts the authority of the Vedas and the Agamas and are, hence, not different from Hinduism. The separate religion movement died down after this rejection only to be resuscitated by Siddaramaiah earlier this year under a different nomenclature – ‘Lingayat as a separate religion’ and an origin theory based on 20th century Vachana scholarship. The Veerashaiva-Lingayat community is the third most populous community in Karnataka after the Dalits and the Backward Classes. Of the 6 crore Kannadigas, around 1.25 crore belong to this community. Since the emergence of the BJP under B.S. Yeddyurappa, large sections of the community began to identify with the party. The unity of the community and it’s support for Yeddyurappa are crucial for the BJP to come back to power in 2018 as well as win a considerable number of Lok Sabha seats in Karnataka in 2019. The movement to divide the community and secure minority status for a section of the same assumes political significance for this reason. Below are the details of some of the prominent political leaders associated with the movement. MB Patil – M. B. Patil is an INC MLA from Bableshwar, Bijapur, who has been Minister for Water Resources in the Government of Karnataka since 2013. He runs the Bijapur Lingayat District Education Association (BLDEA) which was established in the year 1910 and manages 75 institutions in various educational institutions ranging from primary, secondary, high schools to PU Colleges, Autonomous Arts, Science and Commerce Degree Colleges, Engineering College, Medical College, Business Schools, Pharmacy College, Nursing College and professional institutions like Colleges of Education, Polytechnics & BLDE University. Vinay Kulkarni – Vinay R Kulkarni is the INC MLA from Dharwad and is also the minister for Mines and Geology in the Government of Karnataka. He is suspected to be the brains behind this movement. SA Jamdar – SA Jamdar is a retired IAS officer and at present, the secretary of the Lingayat Dharma Horata Samiti. He interacts with the media on a regular basis and most leaders direct any non-theological queries to him. Dr. Sri Shivamurthy Murugha Sharanaru – The current head of the Maha-Math i.e the Murugharajendra Math to which almost every Virakta Math (subsidiary math) in Karnataka used to owe allegiance. He took control of these institutions but lost some amount of control. However, most of the Swamijis from non Jangama (priestly) castes among the Lingayats have obtained deeksha and property from this seer and therefore owe allegiance to him. Increasingly, the influence of this seer and the Math is decreasing to the iconoclasm and anti-ritualist tendencies displayed by the seer (Information gleaned after talking to multiple people from the Veerashaiva- Lingayat Community’s elite). Mate Mahadevi – The controversial and self declared Jagadguru of the Lingayat community is an important leader of the movement. She claims to be the reincarnation of Akka Mahadevi, a revered medieval mystic. She is known for allegedly altering Basava vachanas by changing the invocation from the original ‘kudalasangamadeva’ to ‘lingadeva. She is known to have political ambitions and had contested the 2004 Assembly elections. The theological arguments for the separate religion demand are not new. It is, therefore, necessary to look at what else is powering the latest episode of the separate religion movement. Siddaramaiah believes this issue will polarize the Lingayat community and hence enable him and the INC to get a greater section of the community’s votes by aligning with the faction demanding the separate religion status for Lingayats (hereinafter, the ‘Lingayatist faction’). This is important in view of the anti incumbency being faced by the government especially among the Lingayat community who are aware that the INC government came to power due to the split between the BJP and Yeddyurappa in 2013. It stands to reason, that the INC will probably now go to Lingayat voters saying that they are in support of the demand which will give Lingayats all the benefits of being a minority and claim that the BJP is opposing an action which would give them these benefits. These benefits include massive scholarships from the Central Government (>1890 crores under the top 3 schemes of the Minority Affairs Ministry) , the Pradhan Mantri Jan Vikas Karyakram run by the Government of India which funnels enormous funds through Centrally Sponsored Schemes (CSS) into districts which have a minority population greater than 25%, as well as state government schemes meant exclusively for minorities like the infamous Shaadi Bhagya (wedding grants to poor girls exclusively from minority communities), more than Rs. 690 Crore worth annual grants under the Minority Development Corporation and the Chief Minister Minority Development Programme (2017-18 Budget, Government of Karnataka, Vol.5), access to a disproportionately funded minority only state level scholarship scheme for pre-matric students, and more. While, INC Leaders like MB Patil and Vinay Kulkarni are using this movement as a means to build their profile as political leaders who have influence beyond their respective constituencies and to ensure that they do not lose their own seats to the BJP, muslim organisations like Anjuman-e-Islam which is traditionally known to support the INC in the state, were reported to have supported the Lingayat rallies too. 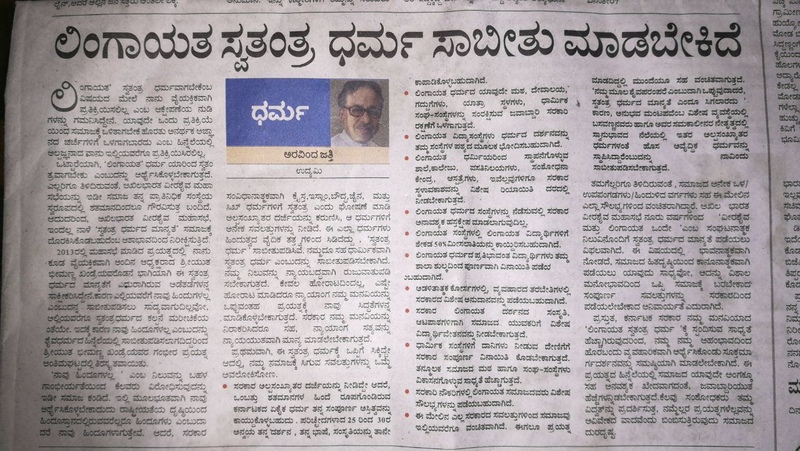 Meanwhile, committed Congress Intellectuals have been pressed into service to build intellectual support for the demand in the kannada news media. Maths and political leaders who are a part of the Veerashaiva Mahasabha, have built up their influence over the community by running educational institutions – primary, secondary and higher education including medical education and ITIs. They have also attempted to enhance their status through their involvement in the building of social welfare institutions such as subsidised hospitals. Currently, educational institutions, which are a huge portion of their influence building, money making and social service activities are subject to the same regulatory hassles that other Hindu run educational institutions are subject to. If the minority religion status is given to the Veerashaiva-Lingayat community, these institutions will have near-complete autonomy similar to the one christian,muslim and other religious minority run institutions enjoy by virtue of the 93rd Constitutional Amendment which nullified the landmark PA Inamdar and TMA Pai Judgements of the Supreme Court. It would seem that it makes complete economic sense for leaders who run educational institutions to demand minority status in this context. A trustee of the Nonavinakere Matha in Tumkur had this to say – ‘The RTE Act implementation beginning in 2012 has created the conditions for this demand to be even considered by a lot of Mathas. Earlier, the Mathadeeshas would ask anyone demanding this to shut up but important Mathas like Siddaganga and Suttur have chosen to not do so immediately this time around’ (In conversation with the trustee). Moreover, Religious institutions of the Hindu community are vulnerable to harassment and takeover by the state government unlike Muslim, Christian and other minority religious institutions. The current government had almost passed a law – Karnataka Hindu Religious Institutions and Charitable Endowments (Amendment) Bill, 2014; which would enable it to take control of the Maths the same way it has already done for Hindu temples. Given that the current government is very proactive in bringing Hindu temples under the control of the muzrai department, those putting forward the separate religion demand see this as a feasible way to protect their religious institutions. In fact, during this author’s conversation with multiple Mathadeeshas, this was a recurring theme. As of now, it appears that new and/or small Mathas who have not built up educational institutions prior to the RTE being passed (2009) as well as significant property like the religious institutions of other religions, are more active in the Lingayatist movement for the exemption is the only way for them to increase their institutional power and influence like minorities already can. Amongst established institutions, there is a divide, almost along party lines. BJP Rajya Sabha MP Prabhakar Kore who is the Chairman of the Karnataka Lingayat Education Society, the biggest private education provider in the society has opposed the demand. INC Minister Eshwar Khandre who runs a number of educational institutions too has backed off from supporting the demand. INC Minister MB Patil who inherited the post of Chairman of another famous education society – Bijapur Liberal District Education Association, from his father and famous Congress politician BM Patil, is one of the lead campaigners for the separate religion movement. These reasons have been specifically mentioned and detailed by SA Jamdar, retired IAS officer and secretary of the Lingayat Dharma Horata Samiti in multiple rallies, advertisements and also by Arvind Jatti, the President of Basava Samithi, and others in various newspaper articles. Where is the Movement Headed ? The movement has managed to find a level of support among a growing section of the elite, especially those closely involved in community affairs and management of educational institutions. However, except for a few isolated pockets of Bidar, Chitradurga and Gulbarga districts, the movement is yet to catch on among the masses and in places like Bijapur and Belgaum, it has contributed to the anti-INC sentiment. The locals in these areas see this movement as an artificially engineered divide and consider themselves an integral part of the Hindu religion. A large section of the community feels that this is an attempt by INC to divide Lingayat votes to prevent a Lingayat, i.e., B S Yeddyurappa from becoming Chief Minister and allow a Kuruba, Siddaramaiah, to remain as Chief Minister. M B Patil and Vinay Kulkarni are thus seen as traitors to the cause of the Lingayat community. It is this feeling that has made Eshwar Khandre, Bhalki MLA and Bidar District in Charge Minister, distance himself from the movement. Even senior Congress leaders like Shamanur Shivashankarappa have begun speaking out against the Chief Minister on this issue as they see in this an attempt to dilute the strength of the community in politics. Many argue that the activities by MB Patil and Vinay Kulkarni are seen as them meddling in affairs that they have no locus standi in. Evidently, Even in Bidar, Gulbarga and Chitradurga districts, the present level of support is being over-estimated and/or hyped. For example- the Gulbarga rally of the Lingayatist faction in September had only about 40,000 people in attendance with a lot of them being non-Lingayats. Many in the media exaggerated reports that more than 2 Lakh people had participated in the rally. While Bidar was a massive stronghold of the Lingayatist faction with almost all the prominent Mathas in the district supporting them when the initial Bidar rally took place, the situation seems to have altered as of early November with a few Mathadeeshas changing their stance in order to align themselves with INC Minister Eshwar Khandre, who took a stand against the Lingayatist faction. Moreover there is resentment within the community over the ‘external aid’ to the movement from muslim organisations, especially in the Hubli Rally. Additionally, among ‘caste lingayats’ whose support is necessary to the movement’s success, there is vocal opposition to the leaders of the movement buzzing in people belonging to dalit and other castes to these rallies. The pockets of support for the demand are mostly a function of the Mathas in these areas being very Lingayatist, especially the iconoclastic Murugharajendra Matha. In the Old Mysore region, people are as yet undecided and waiting for the Siddaganga and Suttur Mathas to point them in the right direction. The Siddaganga Matha’s public humiliation of MB Patil over this issue has been interpreted by many as a signal from the Siddaganga Matha to oppose the issue. What does this hold for the 2018 Karnataka Elections ? To gain the acceptance of the masses, the political leaders of the Lingayatist faction are pushing a combination of an economic argument (detailing the economic benefits of the separate religion tag) along with the original theological argument of Lingayatism being an egalitarian and progressive religion. They have issued ads in local and state newspapers detailing the economic benefits. A ringleader of the movement, retired IAS officer S A Jamdar, spent considerable amount of time detailing the same during their maha-rally in Gulbarga. While this may marginally increase the acceptance of this demand among the masses, it is apparent on the ground that it won’t impact electoral outcomes in the 2018 assembly elections. Recently, B.S. Yeddyurappa, after an extended period of silence over this issue, has openly come out in opposition to the separate religion movement and said that Veerashaivas are not different from Lingayats. The Veerashaiva Mahasabha under Shamanur Shivashankarappa is proactively coordinating the mobilization of the veerashaiva laity against the separate religion demand while the seers of the powerful pancha-peethas (5 peethas) of the veerashaiva-lingayat sect are touring across Karnataka to oppose the demand for the separate religion. It almost seems everyone is out to bury this movement.